Dispatches are in reverse chronological order, with the most recent appearing first. 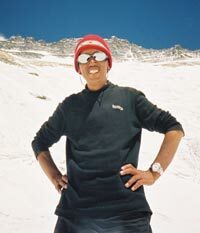 Hello, this is Rob Chang, Director of ECFACE 2005 (climbingforacure.com) checking in from Katmandu. Well it has been a busy few days since my arrival back to Katmandu. After my descent off the mountain and heli-vac to the CIWC Clinic, my check-up disclosed PE and CE and an eye issue too. I've been recouping here and have a few thoughts about this season. Its been good to see other climbers here, making it back and sharing the stories of all the adventure that was prevalent on Mount Everest this season. Unfortunately,we still are gettting news of hardship and tragedy on the mountain, but most of us veteran climbers are glad to see this long and tough season near its end. Last night I had dinner at the Rum Doodle with IMG's Mark Tucker and MM's Willie Benegas, and the discussions and conversations were light - which after many of the occurrences, were much needed. This season obviously heralded in the latest summits ever on the South side, and of course, managed to take the lives of no less than 5 climbers, but as Everest can be, it is still a serious endeavor that brings out the best in people too. It was a great observation and learning experience to see other teams try to work so hard to coordinate unlike in the past - and in some respect, a few key players always make it happen - some real credit should be given to these guys, as if they didn't make the initial moves, maybe none of us would have gotten to the top. 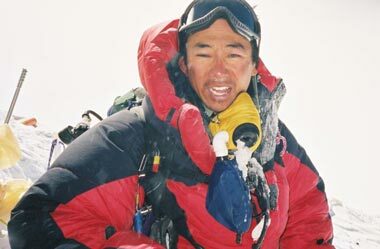 My summit with Ang Pasang on May 31st, along with the historic summit of my Sirdar, Apa, my fellow team member John Gray and Dawa Sherpa will be one of the crowning points of my short 17 year climbing career, but one poignant and crucial thing not to be missed was that there are always leaders, and there are always followers. Those who lead on the mountain - helped make success a reality this summit season. I remember when I asked Apa if we were going to get a shot at the summit, and when he replied "maybe Everest needs a rest this year" I became skeptical. But one of the key ingredients to mountaineering is partnership and camaraderie, not just amongst your own team, but with others, and to this end, I would like to thank all the teams, especially Mountain Madness (yes still owe for crab Chris), Jagged Globe (thanks for the meat), Shauna Burke and Gary (great salami), IMG and Mark T (laughs, bday, scotch and weather) AAI (Willie, Nellie, Vern and stories/beta) and all those others that brought together a sense of what climbing Everest is really about. June 3- Katmandu - hello, this is rob chang updating from katmandu. first i would like to thank all our sponsors, well wishers and supporter all over the world for our project. I think the success of this project is less about the summit and more about the people who have been involved(but the summit is nice!). for right now, I am going to give a synopsis of the account at my end, as our BC Manager Paula Stout had given a great account of what had happened to John G., Apa and Dawa. As for my end, my climbing partner, Ang Pasang and I did not have good or clear radio contact, thus the confusion of what was going on. Also, as John "Sherpa" and Apa were on the speedy track I was still fighting some stomach illness that I fought off proactively with dosages of immodium before our summit push, but did not help my hydration factor. Climbers on the yellow band. Rob being blasted by the wind... oh, by the way, that's on the summit! Ang Pasang (of Thame) -- his sixth time on top! Rob in the aftermath; the winds really did pick up when we summited, and the windburn/frost-nip on my face proves it! May 27 , 28 Camp 2- As the wait lingered on, some members had to make the distinct decision, to head home due to time constraints, work requirements and other personal issues. In our tent at Camp 2, we discussed honestly what each wanted to do. This can become one of the most difficult decisions a climber can make, to stay or to go. We had many basis to figure this out, the condition of the ice fall, the danger to the Sherpas, to the climbers and if there was really going to be a shot. This was discussed to the heart from each climber. In the end, I had insisted on my point to stay one more 24 hr. period. Other members were skeptical, but I had given up on too many other climbs too early. John Gray, being a partner on a few of these climbs mulled it over, and in the end - simply said, yes, I'll stay one more day. Dr. Chuck Huss and Dan Smith had met their time deadlines and decided to head down. It was a tough discussion, whichever end you were on. With some free time, I am able to do a sat phone interview with my NBC affiliate in California - which was funny since I didn't have a pen or paper to write down the phone in number - so I scribed on a rock (serious, I have a pic of it) I also shot a video salute for Memorial Day weekend for my friends in the 129th Pararescue Group and the 1st Marine Division outside my tent at 21,000+ feet. As optimistic as some were, a lot of people thought our shot was too late, there were other teams trying to summit a day earlier, and regardless of what anyone says, all the weather reports were anything BUT dependable - only a neophyte would claim they really knew what was going on. Winds were still high, temps cold, but still on the margin of what we mountaineers call "climbability". May29 - Camp 3 - John and I move to Camp 3 - the ascension is one of straightforwardness and focus. John and I joke that its the anniversary of Sir Hillary's first attempt, heck of a place to be - on the actual climb - what a place in history. I still have stomach issues, but our trip to Camp 3 is one of vast improvement from the first. We have a new tent area, without some off angle canter, our Sherpa climber is "on it" in terms of water and having things ready to go. We start sleeping on O's and now it feels like we are going somewhere, though we don't know whether its up or down. The wind blows, but the temps are warm. I do a spoof here at almost 24,000 feet on our ledge in my CW-X outfit, the world's highest fashion show, though the mountaineering inner booties didn't really match. Our Sherpa views the spectacle from his tent and laughs. May 30, 31 - The real push, John and I get up and we are wired. This time getting up hours earlier than our predetermined "Sherpa" wake up time (since it takes a Sherpa 15 minutes to eat, pack and get his gear on and be ready to climb) - it takes John and I more like 2 hours, so we wake up this much more earlier to be ready. The climb to Camp 4 is amazing. It is steep, exposed and hard. Even with the fixed lines in place, the air is so thin, and well, as we hook into what seems like Orchard Supply Hardware rope stock (which it is) - when you start over the Yellow Band - and look down, well at 25,000 feet, you are almost 10,000 feet higher than BC, and it is intense. Once over the Band, the Spur, it levels out somewhat and curves around into the South Col. Here it is Mars, but on Earth. Barren, cold, survival is the word. No sitting outside hanging out like in BC, it is a harsh world here, and no wonder those who perished not far from their tents in 1996 did so in bad weather - I will never second guess someone else's reality after being here. When you set you eyes on the terrain, you know you are the furthest point from outside help that there can be, other than being an astronaut - period. John and I settle into our tent. We are now using O's and feel pretty good. We cook up some food, I try to hydrate some and we settle in. The wind is HOWLING --- The tent at times is sideways. And we are very concerned about just sitting there in the tent. When we arrived at Camp 4, the Sherpas yelled at us to get into the tents, at some point, not out of concern for us, but for the fact that if each tent did not get heavy ballast quick during the securing effort, the tent may end up 35,000 feet above Tibet in the jetstream. Apa comes to us numerous times. He checks our water, how we feel, our oxygen. He is concerned about the cold and the wind. There's to be some tough decisions to whether to climb in these conditions, and we are going to leave it up to him. This is no time for a first and second timer to make assumptions over someone who has been to the summit 14 times and has returned with all his fingers and toes each time. Our plan is simple, start getting ready at 6, maybe mount up and climb around 7 or 8. John and I make our preparations with the utmost seriousness. We know this it, and that its dangerous out there, not just like a normal climb, this is the biggest one that there can be. We take are steps to put our clothes on, layer by layer, hydrate a bit...complain whether or not if we put everything on - hydrate then have to go to bathroom, what is the reverse time of the process...so I wait a bit longer for the harness and down pant process. I gut aches, but I am going for it. John is good to go. At around our H hour, Apa comes in, and says we are on hold, one more hour, too windy, too cold. Our hopes are dwindling. It sounds like a beast tearing at our tent outside. So we calmly understand the hold decision and mull over staying there for the night and then going down. Then around 45 minutes later, Apa comes to our tent, and says, lets give it a try. The reality sets in, our packs go out, crampons go on, headlamps beam, and we are now standing at 26,000 feet in a howling gail, but we are going to give it a try. The strategy will be to get up the first main point on the ride, the Balcony, and then assess how it is. As we start out - right out of camp, there is a semi-steep ice face, being dark, its just a process of finding the footsteps of the person ahead of you. A simple process, unless you are following someone who does not know what they are doing. Not so with our group, John is one of my most trusted partners - and Apa and his Sherpas need no introduction. After this first section the route flattens onto a snowfield for a while then really steepens again on semi-mixed ground. Rock, ice, snow, all different types of stuff, not too hard in the Sierra, but at 26,500 feet, hard, in the dark. Here John, Apa, Dawa pull away and Ang Pasang and I are in the tail of things. There are a few other climbing teams that jostle in front and in back of me and Ang as pace, water and oxygen bottle trade outs are done like a pit stop fashion along the route. This is where radio contact was difficult and spotty. Too windy, and we decided, lets just move. As the hours went on over the sections of the route, it was becoming distinctly aware of how LONG this route is, compared to the little contours on the National Geo map. At one point I asked Ang, when do we get to the Balcony, he says, oh, we already passed it...then the South Summit, same response, this guy knew my stomach hurt, and he just wanted to keep me going - I thought it was out of just not wanting to stop, but he had other ideas. Finally the sun began to rise, and we saw the greater views from above 27,000 feet with the sun rise, with clouds swirling about. Looking almost 5 miles down onto the far horizon was only something I've done in the seat of an airliner, and here I was standing on this ridge, in blasting winds - trying to make a dream come true. We discover all of our water has frozen, and we are still far from the summit, we have decided to push on. We have one small quart thermos for our entire ascent between myself and Ang. This makes us go slower and slower and as one of my support Sherpas has turned around due to cold, I have had to put more gear including another extra bottle of O2 and film and battery gear that the extra Sherpa was carrying into my pack, doubling its weight. As time passed. It became very difficult for me to breath, my lungs were burning, and I felt there maybe some issues....PE perhaps, pulmonary edema, fluid build up in the lungs. We moved on, as we came across the main summit ridge, right before the Hillary Step (I knew this one, it was light, and Ang laughed when yelled - Holy Moly - the H Step!). At the same time we were ascending it, Apa, John and Dawa were descending. Apa's word's were simple -"It's windy, cold - summit, take picture come down - no time." That motivated me and a bit of time later - at around 8:30 am on May 31, Ang and I summited Everest. His 6th time, my first. It was a very special moment as he saw me labor so much, so few steps at a time, and he still said, not bad, 8:30 am. The approach the summit is amazing - though just a lump, the last few hundred feet do not have fixed ropes, is heavily corniced, and so a fall to either side is a multi-mile drop back into Nepal, or get a new visa, into Tibet. This was pretty intense to know to be unroped at literally 29,000 feet and be using the same techniques we teach on Mount Shasta back at home. Thoughts of my sister with cancer, my dad, my mom, Teedie, the breast cancer food group, the Breast Cancer Fund, all those that I try to inspire, and here I am on top of the world...for them and myself to find some grace and peace. Summit is nice, we snap some pics, camcord dead, digi cam is dead, the winds pick up and its blasting to the point where my summit photo is an a la sitting, but for Ang, his sixth summit, he proudly stands next to the summit post. We make our way down the fixed ropes and at about 27,000 feet, I feel a little gurgling in my chest. I cough up some white stuff and know immediately that its not good --- so I take some anti-PE drugs, niphedipine to help. The descent is arduous, hard and slow. Ang helps with the ropes, and ushers me down. I am so dehydrated since we did not have water since the first few hours of the beginning of our ascent. As we make it back down to the area above Camp IV, my dehydration of almost 20 + hours above 26,000 feet with no fluids takes its toll. Late that afternoon, I dive back into my tent - and my first word's to John are - 911 - climber call for trouble. I tell him what's up, I immediately go high on the oxygen and after a while of John taking care of difficulty breathing, assess what to do - and a plan is made. I feel that maybe I should have turned around since I knew I may have PE. It was a pretty intense situation for John, but if there was a definition of coolness under fire, and PARTNER, John was it, after 17 years of climbing, he had the right stuff at the right time. I make it to BC, Paula is there, and has been arranging a heli-evac so I can get my condition in my lungs checked out, but she has some bad news. A helicopter with a bunch of journalist that were coming in for a short stint in BC had crashed that morning right at the pad, no more Heli-access in BC. I simply say, well, stay a night in BC, trek to Gorak Shep, get the heli there the next day. Then Paula comes back and says that the Ministry of Aviation of Nepal has shutdown BC and Gorak, and if I wanted to get out asap - I would have to go another 2hours beyond to Lobuche. So much for my rest night. The mad scramble goes into action, and right after coming down from the summit, staying at Camp 4, going from 4 to 1, then 1 to Lobuche. A couple of the porter Sherpas that went down to Lobuche with me thought I was crazy. So that day at Camp 1 started at 3am and ended at 10pm in Lobuche. June 3, I have a fanta orange drink, two fried eggs in the Eco Lodge in Lobuche, and at around 9 am the chopper shows up. We stop off for fuel in Lukla, pick up a trainee pilot. And by 10 am, I am at a CIWC clinic in Kathmandu. I did indeed have some PE with some other ailments, and because we spotted them early, treated them aggressively (thanks Sherpa John Gray) I am ok and will be fine. Again, thanks to all those who have supported our efforts and we will update a final journal entry soon. At 6:30 am on May 31st, Apa Sherpa, Dawa Nuru Sherpa and John Gray made it to the top of the world on Mount Everest. It was Apa’s 15th trip to the top, Dawa’s 6th one and John made his first ascent in time for his birthday, May 31st. The road to getting to the top was full of lots of waiting and much disappointment. After a fast acclimatization during April, the Everest Climbing For A Cure Team was ready for a summit in early May. Then, we waited and waited and waited....each day, watching the calendar slip by. Weather reports were discouraging each day. One day it would say "perfect weather" if you were already on the top and the next day it would say, "don’t even think about a summit until mid-June." Our team kept focused, however, and were prepared to summit at any time the weather would break. On May 25th, a storm blew into camp overnight and many people awoke with the feeling that a summit would be near, probably on the night of May 29th, morning of May 30th. Our team packed up their stuff and headed up direct to Camp 2 so they would be in position to make a summit attempt. After they got up there, however, the weather reports continued to predict terrible winds, extremely low temperatures and no "summit window." Chuck Huss, Dan Smith and Julie Smith made the difficult decision to pull their climb and they came down to Base Camp on the afternoon of May 28th. That left, team members, John and Rob Chang at Camp 2 hoping for better weather. Just as a reminder to people, here’s the camp rotation during a summit attempt. From Everest Base Camp (17,500 feet) to Camp 2 (approx. 21,000 feet) takes between 6 and 10 hours. 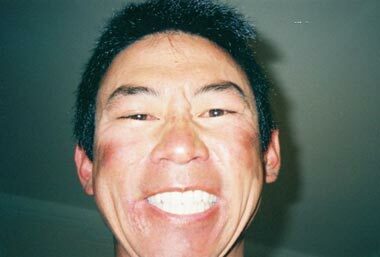 (Earlier in the expedition, John had made the trip in 6 hours so the Sherpas had started calling him "John Sherpa" since that was the time worthy of a Sherpa.) 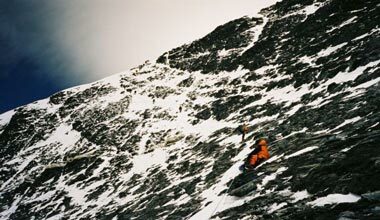 Once at Camp 2, climbers typically take a rest day to gear up for the next push. 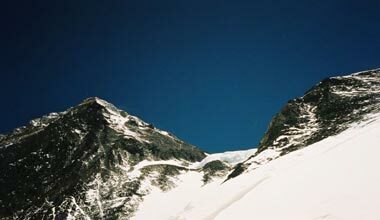 After two nights at Camp 2, the climber should leave Camp 2 around 6:00am and head up the Lhotse Face to Camp 3 (approx. 24,000). This climb will take between 4 and 6 hours. Here, the climber sleeps on a steep, exposed face on tent platforms chopped from the ice. The next morning, the climber heads up from Camp 3 to Camp 4 aka "The South Col". On a good day Camp 3 to Camp 4 takes 5 to 6 hours. The trick, according to Apa, is to leave Camp 3 earlier enough so that you can get into Camp 4 with enough time to rest because the climber will need to leave Camp 4 that night to make the summit attempt. Back to our team, the original plan was for John, Will and Rob to make their trip to Camp 3 on May 28th, which would make their summit attempt on May 29/30. The winds on those date promised to be calmer than any we had seen to this point. However, due to some last minute concerns about line fixing, the three of them decided to wait until May 30/31 for their summit attempt. They spent an extra day at Camp 2, then on May 29th headed to Camp 3. 84 other climbers, however, decided to make their summit attempt 29/30. On the way to Camp 3, radio contact became really spotty so I don’t have many details from that night. John called down and asked for weather and was bummed to hear that May 30/31 was looking less than ideal. The winds were picking up and clouds were bringing snow. 84 climbers did decide to set out for the summit on May 29/30, we believe about 40 of them summited. The first summits on the south side this year by people such as Vern Tejas, Dave Hahn and Shaunna Burke. These were also, the latest "first summits" of any season. This has been a really weird year weather-wise. 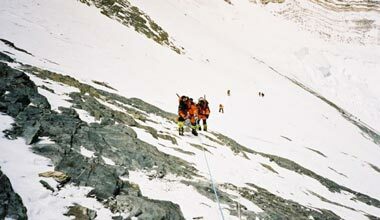 While the 84 climbers were making their summit attempt, John and crew were heading up from Camp 3. The Sherpas, who had been hanging at Camp 2, made their way up from Camp 2 to Camp 4 and both Sherpas and Climbers rendezvous’d at Camp 4 to get ready for their summit attempt. Since they would start their climb at 8:00 pm that night, it was important for all of them to get as much sleep as possible to prepare for their ascent. Once the team woke up, there was much discussion whether to make the summit attempt on the 30/31 because the winds were blowing so hard. Apa had the team wait until 9:00pm, and, at that point, even though the winds were howling and the snow was knee-deep, the three climbers and four sherpas (Apa Sherpa, Dawa Nuru Sherpa, Lakpa Nuru Sherpa, and Pasang Temba Sherpa) started off for the summit. Summit night moves in phases. The climber moves from Camp 4 to "The Balcony" which will take between 4 and 6 hours. From the Balcony the climber goes to the South Summit (a trip that will take 3 to 5 hours) and then, South Summit to Summit, with travel estimates of 2 to 3 hours. Those times are under good conditions. The climb on 30/31 night was not good conditions and promised to take even longer. Since our radios were on the blitz, I kept track of the team’s progress through other teams who were making their summit attempt as well. On the night of 30/31, we estimate there were 35 people going for the summit. Not that many given the size of the mountain, but the other team’s were wonderful to keep me posted throughout the night on conditions and position of our climbers. It was a long, anxious night until around 6:45 am, I got the radio call from John stating, "My Polar watch says 29,100 feet and I’m calling from the summit." All of our Base Camp erupted in great glee...yelling and shouting...clapping our hands. You can’t imagine how happy it made all of these folks that "John Sherpa" along with Apa and Dawa made it to the summit together. They stayed there for a few minutes taking photos, etc, then headed on down. Apa is coming all the way down to Camp 2. John, according to Apa, is happily ensconced in his tent at Camp 4 and is doing really well. The other team members are also "fine." But it is unclear how many more summits we had because the radios are on the fritz. We know that Will and Lakpa had to turn around at the South Summit. 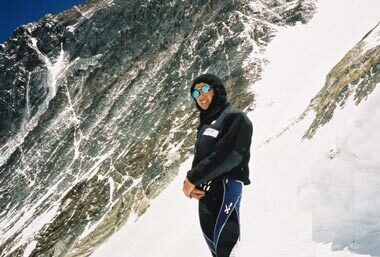 Our hope is that Rob Chang, wearing his prized CW-X pants, and Ang Pasang also summited, but we don’t have confirmation on that yet. According to the Sherpa radio grapevine, however, we’ve heard that they are safe wherever they are. We should have more information later today. Sorry for the long email, but since we’ve been so quiet, thought you wouldn’t mind some of the nitty-gritty details. Hope all is well with you. Cheers. p.
Rob called in his dispatch today. He said that yesterday they climbed all the way from base camp to Camp 2 in one shot. They are all in good spirits but pretty tired after such a huge effort, so they are taking a rest day today. From here, they plan to move on to Camp 3 on Saturday the 28th. Our team is busy packing. The last 5 days have been full of weather reports and team interactions that belie upon comparing what is acceptable for our team versus what's acceptable for others in terms of cold temperatures and high winds. Finally, we feel that the shot we will get has come, and we are planning to head up on the 26th of May to Camp 2 to start our summit attempt. We will rest on the 27th - and if the winds and forecasts hold true, will head to Camp 3 on the 28th, Camp 4 on the 29th, start our summit attempt that evening and hopefully summit on the 30th of May. We do have the supplies at Camp 2 to hold out for a few days if the better weather does not bear fruit on the 29th-30th. My teammates and I are at least finally getting to relieve some of the pressure that has built up over the last month, and at least, we see some reasonable conclusion to our climb and expedition. Our hopes were raised by better forecasts, and our BC Manager had been telling us all week long that it was going to improve - its always good to have a great cheerleader here in camp, and hopefully we will get our good window - or acceptable window for our team. Other teams have been heading up today as well as pretty much almost all other teams are heading up in the next few days to give it a go. The rope fixing operation set up by the "commission" in BC in which our BC Manager had a big hand in is in place and finalizing the placement of gear, materiel and Sherpa power. It will be a unique occurrence to be here at least on the mountain for the annual anniversary of the first summit (May 29, 1953). Chuck, Dan, John and I are healthy and ready to go. Paula has assumed "mission control" status and will monitor our progress as we move up the mountain. Mount Everest Base Camp (17,500 feet), Nepal - The highest peak on earth is synonymous for climbing, great human challenge and tragedy - but this year, for the first time in many decades - there is a chance that it will become known for something that has not occurred for numerous climbing generations, no human reaching its top from the south side - the Nepal side. I have been on Everest for the past 60 days with my team of 3 close friends, waiting out what has become some of the most unusual weather since the peak was first climbed in 1953. My expedition, the Everest Climbing For A Cure Expedition (www.climbingforacure.com), came here to raise awareness for breast cancer. Being a resident of the Santa Clara, California, Everest is a far place from the Sierra and nice confines of the South Bay Area. But the allure of one human kinds greatest physical achievements in combination with the opportunity to promote cancer awareness and a healthy lifestyle, made Mount Everest an ideal candidate for us to "climb to benefit others." Anchored by my intimate experience in watching my oldest sister die from cancer in 2001, I decided to form a grass roots organization called climbingforacure.com. Its focus is to raise awareness and funds for other prominent cancer organizations through climbing the high peaks in the world. In 2002, I was diagnosed with Graves disease, and subsequently had my thyroid gland irradiated and am now a daily taker of thyroid medication to balance my hormone levels for the rest of my life, not making my Everest aspirations any simpler or easier. When we arrived here in Katmandu, Nepal in late March, our plans were ones of straightforward lists and of personal dedication. Our Sirdar, or Nepali team leader, Apa Sherpa, is famous throughout the climbing world for his record 14 summits of Mount Everest. His leadership and insight are an integral part of our small yet highly skilled team. Early and in the mid-part of the season, Everest beared her fangs on the south side, taking two lives - one of a Canadian, and one of an American. One of our friends here in Base Camp was a partner to the American and the day of the incident, our camp was the first one he stopped in at after the fatality for which he was witness to. His first hand story to our team was one of the dangers of climbing on the highest peak on earth and hammered into our psyche the reality of how mortal all of us are who come onto Everest's slopes. An eerie feeling set into my mind as I discovered that the rescue operation that I was video taping earlier in the day from far down in Base Camp was an event of someone actually losing their life. 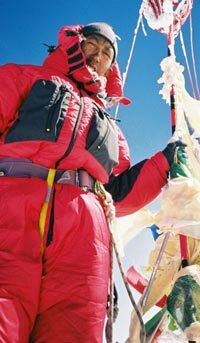 We have had numerous reports of climbers topping out on the Northside of Everest, from the Tibet side, but with a price. Frostbite, loss of life, all have occurred, so our summit plans are tempered by our judgment and agreement to what my team is willing to give up for a shot for the top. Our strategy truly is round trip, there is not a all or nothing attitude here, and safety is a word that is for once in many decades, is resonating through out Base Camp. Many big and small teams have formed a coalition, being organized by some of the most experienced and veteran climbers that Everest has to offer. There has been a plan laid out to share summit strategies, oxygen, camps, ropes, equipment high on the mountain. My team's Base Camp Manager has even become the "clearing house" and keeper of details for this master plan and for once, contrary to common past practice, most teams here have contributed and have come together to make a summit bid as safe as it possibly can be, if there is such a thing here. Talk among our Sherpa staff, the native people who bear the real brunt of equipment carrying and climbing responsibilities, and they say Everest is mad this year. We have had many traditional Buddhist prayer ceremonies to try to clear the air, but to no avail, high wind speeds up to 100mph and cold temperatures down to minus 50F have plagued the upper slopes of the mountain. Each team is allowed to stay here 75 days from the point of entry into the region. Our days are ticking, but even more on our minds is the condition of the famed and treacherous Khumbu Ice Fall. More climbers have been killed in the Ice Fall than most other places on Everest. Typically, this late in the season, it would be crumbling and flowing with water due to warm weather brought in by the monsoon season of Asia. This year it is different, the monsoon was not early, and the Ice Fall is still in fair condition. But given 48 hours of warm weather, and all those in camps above Cold be trapped by the melt of this labyrinth of ice, seracs, snow, crevasses and rock. Our weather forecasts are improving somewhat, we plan to give our team one shot at the top, leaving for the summit on May 26 to Camp 2, and hopefully summiting around May 29 or 30th if the weather cooperates. If the weather turns for the worse once again and the official climbing season closes, we will be personal witnesses to one mountaineering's most notable and memorable occurrences, no human summiting the top of the highest peak of the world from Nepal in many generations.